Sensoji in Asakusa is the oldest temple in Tokyo and its foundation can be traced back to 628. Asakusa became a busy temple town already in the medieval time when the rest of the present Tokyo area was only sparsely inhabited. In the Edo period (1602-1867) storehouses for land-tax rice of feudal lords (*) were built on the west bank of Sumida River to the south of Asakusa. Rice dealers made fortunes and spent their money in Asakusa. Yoshiwara, the officially approved district for prostitution, opened to the north of Asakusa after the great fire in 1657 and all three kabuki theatres were also transferred to the north-eastern area of Asakusa in 1842 in the context of the government reform. Therefore, Asakusa was developed to be the most popular entertainment district of Japan towards the end of the Edo period. (*) Tax was paid in the Edo period in principle in form of rice. Feudal lords brought their rice to Edo, sold it and earned money. Merchants who took care of tax-rice became extremely rich. Edo became Tokyo in 1868. But, Asakusa kept its status as the leader of entertainment and culture in Japan and was eager to introduce novel things from the West. For example, the first "skyscraper" was built in Asakusa in 1890 and opera experienced a boom in Asakusa at the beginning of the 20th century. Even after WWII, Asakusa remained as a popular entertainment district. Many Japanese entertainers started their career in Asakusa. For example, the film director and comedian Kitano Takeshi, winner of Leone d'Oro at the Venice Film Festival, started his career in the entertainment world as elevator boy of a strip theatre France-za in Asakusa. However, when movie started to lose its popularity in the 1960s because of TV and Asakusa suffered from the loss of visitors. The urban vitality of Tokyo shifted from its east to west such as Shibuya and Shinjuku. I hear that Asakusa is undergoing revival since the 1990s. Sumidagawa Firework festival, historical bus tour and Asakusa Samba Carnival attract lots of visitors. 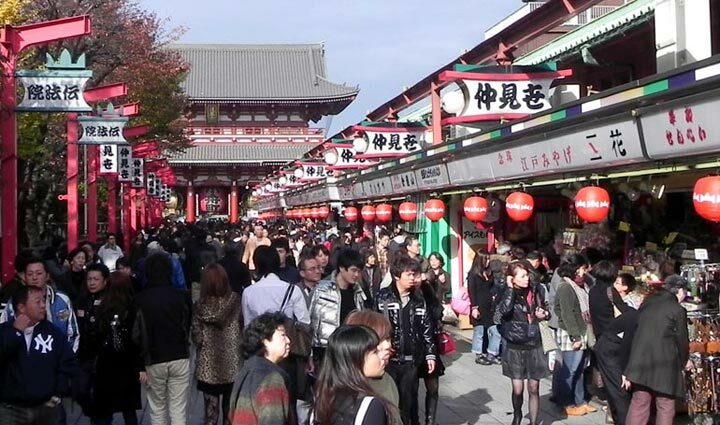 Thanks to its uniquely traditional atmosphere of "shitamachi" (**), Asakusa is the most popular destination for foreign tourists in Tokyo. (**) In the Edo period, the city area was divided in to two zones, "shitamachi" and "yamanote". The district inhabited by merchants and craftsmen was called "shitamachi" (lower town) as it was physically low and flat land such as Asakusa and Fukagawa. Samurais on the contrary lived in the hilly area such as Yotsuya and Azabu and their district was called "yamanote" (hill side). Nowadays, when we think of "yamanote" it includes further western areas such as Setagaya and Suginami. However, I cannot feel much reality in the recent revival of Asakusa. The contemporary Asakusa is somewhat akin to a theme park. "Oiran-show" (***)for tourists only imitates the Oiran dances in the Edo period. Important buildings of Sensoji are mostly not original but reconstructions after WII using reinforced concrete. Firework festival is a revival of the old tradition. Samba has its origin of course in Brazil. I believe that all new attractions are borrowed from the past or from foreign countries or cheap imitations of the original, but nothing is really created in the present Asakusa. (***) "Oiran" was the highest rank prostitute in Yoshiwara. "Nakamise" is the oldest shopping center in Japan. Neighbors were allowed to have a store in return to their service to the temple. Please refer to the official web site of Nakamise. 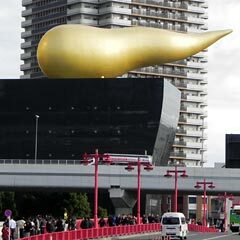 This strange golden object exists already for a few decades and is now a sort of landmark of Asakusa. Anyhow, the people living in Asakusa surely feel happy that Asakusa now prospers again. The opening of Tsukuba Express line with the station near Sensoji contributed to the revitalization of Asakusa area. Tokyo Sky Tree will be completed soon and people will have another reason to visit Asakusa. Asakusa have many shops, restaurants and institutions rich in tradition. 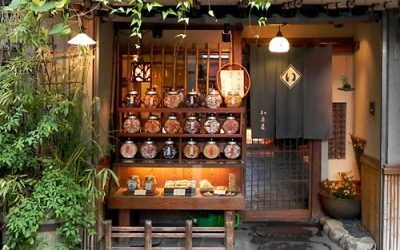 I for instance often buy "senbei" (rice cracker) at this shop with elegant fasade. When I visited last time I was much surprised, because sales people talked with French guests in Chinese. It was an interesting view to see Japanese and French people communicating each other in Chinese in Asakusa. It reflects the time we now live in. Another tourist attraction Kappabashi is also located not far from Sensoji - or Kappabashi is a part of Asakusa - and we hear much more Chinese there. Maybe half of the visitors of Sensoji are foreign tourists from various parts of the world. Asakusa and its tradition are now saved and kept alive by foreigners.